Soon after posting the first teaser of its all new Lincoln Navigator 2015, company shared official details of the model as well. With most of the eyes anxiously looking ahead for model to make its release, Lincoln is still to share the performance specifications of Navigator 2015. Reason behind the curiosity is some of the new features and design elements. To begin its pricing from $62,475, Lincoln might take it up to $72,900 for its Reserved Package version. Let us have a closer sneak into the peak elements and features added in this new release. 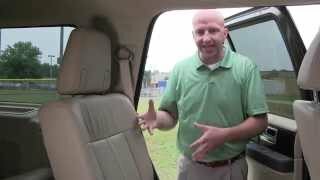 Interior of Lincoln Navigator 2015 comes with some of the finest quality materials that undoubtedly are higher than those it used till date. 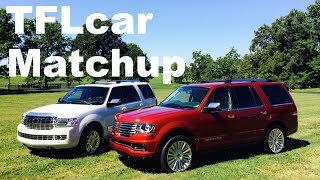 This clarifies reason behind releasing Lincoln Navigator, that company has intentions to improve luxury it offers, this might be due to growing automotive market. We also noticed revised switchgear and Power Fold third-row seats, which are definitely a new step by the company. Model comes with some of the top-in-class features like premium Ziricote wood trim around the interior and hand wrapped instrument panel featuring contrast stitching. Works of finest leather was also noticed in wrapping all three rows of seats, armrests, center console and yes the transmission shifter. With capacity to accommodate this Ultra-Luxurious interior featuring model portrays its highly spacious interior and thus increases expectations from its exterior too. Let us scroll down and find what customers will get in the exterior of Lincoln Navigator 2015. 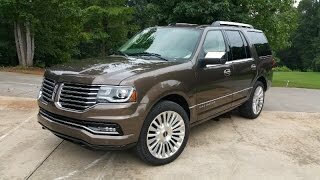 With the exterior of Lincoln Navigator 2015, company announced its highly innovative thinking and level of luxury and looks it’ll offer in future. The benchmark it created here with this work has raised the competency level for models like Cadillac Escalade. Some of the exterior updates that company shared includes, iconic split-wing grille over sleek front end. We also noticed some redesigning over its hood. However as shared by company Lincoln Navigator 2015 will get stunning redesigned LED Lights, HID adaptive headlamps featuring LED accents and power up/down tailgate. 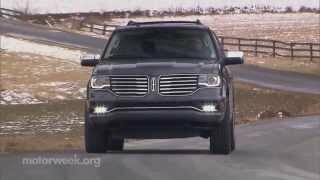 2015 Lincoln Navigator will be replacing the traditional 5.4 liter V8 engine and will house beneath its hood, more powerful and fuel efficient 3.5 Liter, twin turbocharged EcoBoost engine delivering total output of 370 hp and peak torque of 582 nm paired to six speed automatic transmission. The automatic gearbox will be sending this entire power depending upon your preference; you may go for Rear Wheel Drive or All Wheel Drive.